My beef with the cleric has been long and well-roasted. In the new year, I'm going to be starting a new Labyrinth Lord campaign (a welcome change after my experiments with D&D 5 this year) and thought it was maybe about time to come up with a divinely blessed class which is to my taste. Lo and behold! The adventurer cleric. (Primarily) A divine class without any moral imperative and which can fit in with the usual assortment of mercenaries, rogues, cut-throats, and murder-hobos. Cutting down the power of clerical magic a bit -- no raise dead. Reducing the class' spellcasting advancement -- no spell at 1st level and a maximum of fifth level spells. The B/X Rogue: Now Available in Print! The postal gods smiled kindly upon me this morning and delivered the long-awaited proof copy of the B/X Rogue. All looking spectacular, I have switched the switch at RPGNow: tis live! Thou mayst get thy hands on it here! 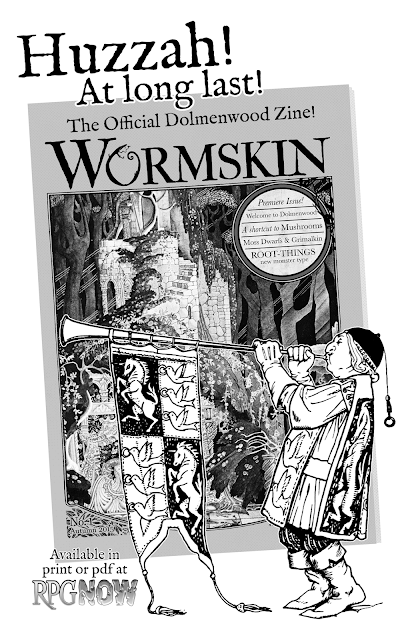 The first issue of Wormskin -- my and Greg Gorgonmilk's zine exploring the mythical Dolmenwood -- is (dare I say it?) poised for release. (See grumpy cat.) I have completed the layout and it is in the fair hands of the Gorgonmilk, awaiting his ducal seal of approval. Get your nostrils ready for massive infusions of dank moss. Also: following on from the critically acclaimed (James Spahn, Tim Brannan, and Eric Fabiaschi liked it) B/X Rogue, I will shamelessly admit to having begun work on a sequel: the B/X Warrior. I imagine you can guess what it might be about. Additionally: I am pleased to share that my home games are about to revert to Labyrinth Lord, after a brief flirtation with 5e. "Not my cup o tea" would be a fair summary of the experience. May all your dreams be mossy. The B/X Rogue: Out Now! Climbing walls, hiding in shadows, moving silently, removing traps... There must be more to the adventuring life than this! Explode the talents of your sneaky characters with this book! More than simply a thief, the rogue class has access to talents drawn from a wide array of archetypes, all integrated into a single class. Scouts & spies, burglars & tomb robbers, charlatans & con-artists, swashbucklers & explorers, brigands & highwaymen, assassins & thugs. No need for all of those specialised sub-classes any more! Wormskin Issue 1: Delayed But Not Dead! Well, as often happens with such things (when one is doing this as a hobby, not as a job, at least), writing was delayed, layout was delayed. In this case, the only thing that wasn't delayed was illustration! Hurrah! But! I have this very evening put the finishing touches to the text of issue 1 and will be embarking upon the layout process in the coming weeks. I'm not going to be foolish enough to say anything like "it should be ready be the end of the month!" (again), but wanted to put the word out: it is still happening! The grimalkin race-class (witnessed in sketch form here). Three new spells of cat-kind, including the terrifying (?) furball. The moss dwarf race-class (glimpsed as a wisp here). One (1!) new forest-creeping monster: the root-thing. 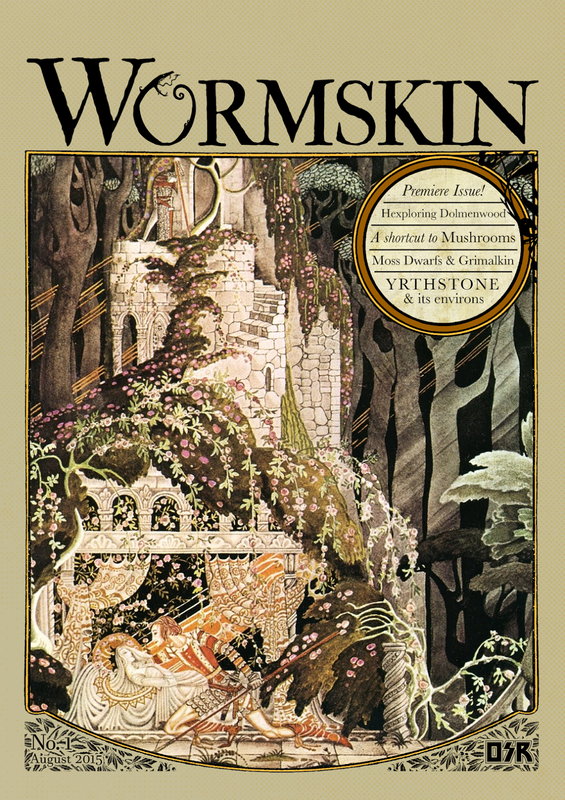 A hearty article on the fungi of Dolmenwood: edible, psychedelic, and poisonous. How to identify them? What are their names? What shall come to pass upon consuming one? All this and more is answered! Coming soon(ish). Keep 'em peeled! Periodically, in my musings on D&D, I feel the need to create a new thief / rogue class, often mixing in elements of other rogue types such as assassins, acrobats, and bards. Well, the stars have aligned just right, and the following has been bouncing around in my head. Instead of a fixed set of skills advancing at a predetermined rate (like the standard thief class), the character has an expanding set of largely non-advancing skills. A 1st level rogue knows four of the skills below (player's choice). One more skill is learned at each level increase. From 5th level, the character may choose from the list of advanced skills (those marked with an asterisk). Learning an advanced skill requires that the rogue first learn the associated normal skill (e.g. move silently requires move quietly). Pick pockets: requires a successful DEX check. The victim may save versus spells to notice the attempt. Sleight of hand: used to surreptitiously manipulate items, perform tricks of legerdemain, delicately extract or swap out objects from pressure plates, etc. A DEX check is required for success. Mimic voice: general accents can be mimicked with ease. To convincingly mimic an individual, you must listen to them speaking for at least ten minutes. If there is any uncertainty, listeners may make a saving throw versus spells to detect the ruse. Move quietly: when lightly encumbered, you can sneak quietly. (Other characters may attempt to sneak, but without guaranteed success.) In an environment with no ambient noise to mask your movement, an attentive listener may notice you -- save versus wands. Move silently *: when lightly encumbered, you can sneak absolutely silently. Back stab: when attacking a humanoid victim who is unaware of your presence, you get a +4 bonus to attack with a dagger. If the attack succeeds, the precision of your strike inflicts extra damage: 1d4 + your level. Sniper: works the same as back stab (above), but for fired missile weapons (bows, crossbows). Garrote: when attacking a humanoid victim who is unaware of your presence, you can attempt to strangle them with a garrote or similar weapon. Make an attack roll. If the attack succeeds, you have the garrote in place, causing 1d4 damage. Each subsequent round, the victim suffers 1d4 damage and must save versus paralysis or fall unconscious (if you garrote an unconscious victim for one more round, they die). While conscious, the victim may fight back with their fists, small weapons, or by wrestling. All such attacks are at -2, but success indicates they've broken free of your garrote (in addition to normal damage, etc.). Black jack: when attacking a humanoid victim who is unaware of your presence and who is not wearing a helmet, you can attempt to knock them out with a cosh, black jack, or similar implement. Make an attack roll. If it succeeds, the victim suffers 1d4 damage and must save versus paralysis. Failure indicates that they're knocked unconscious. Tight rope walking: expert balance allows you to easily walk or dash across narrow beams. With a DEX check, you can walk across right ropes or beams of less than 6 inches width. Blind fighting: training in the unusual art of fighting while blindfolded reduces the penalty to attacks against foes whom you cannot see. Instead of the usual -4 penalty, you only suffer -2 when making melee attacks. Climb rock faces: when lightly encumbered, you can climb rough rock faces with a successful DEX check. You can climb easier surfaces without a check. Climb rough walls *: your climbing skills are so advanced that you can scale sheer surfaces with only minimal handholds such as the cracks between stone blocks. This requires a DEX check. You can climb easier surfaces without a check. Pick locks: with decent lock picks and a turn of work, you can attempt to open locks without the appropriate key. A DEX roll is required. You may retry, if you fail. Disable small mechanical traps: with a set of thieves' tools and a turn off work, you can attempt to bypass or disable small mechanical traps such as those found on locks. A DEX roll is required. If you fail, save versus wands to avoid setting the trap off. You may retry. Decipher foreign text: with an INT check, you can figure out the gist of a text written in foreign languages which are related to a language you know. Decipher obscure text *: as above, but applies to ancient or obscure languages, at the referee's discretion. 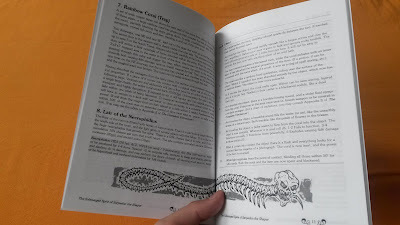 Read magic: you can decipher arcane inscriptions, including those on magic-user scrolls or in spell books. There is a 1 in 6 chance of your understanding being inaccurate. This skill does not allow you to cast spells. Activate magic scrolls *: you can cast spells from magic-user scrolls with a 90% chance of success. Detect magic: with a turn of concentration, you have a 2 in 6 chance of detecting the presence of magic in a 10' area or on a specific object. You may retry. Hear noise: your chance of hearing noises when listening at doors is increased by 1 in 6. The release of the AD&D 2e players handbook in PDF the other day has got me thinking about that edition of the game -- the one I've played the most of, after Basic / Expert. 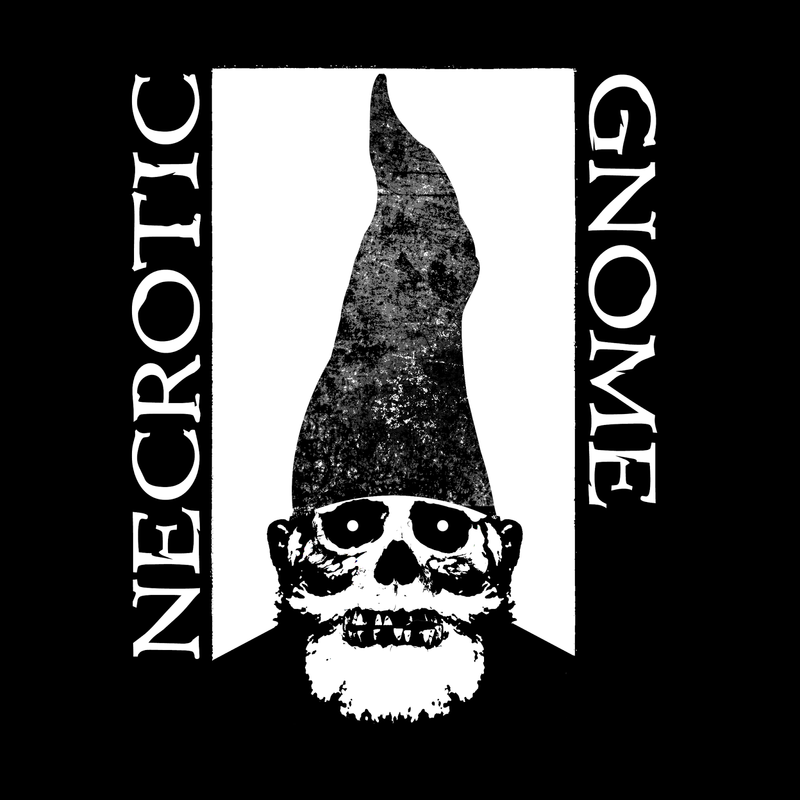 I'm not sure if it'll come to anything, but I'm seriously considering running some 2e games, with a few small house rule tweaks. One such tweak is that I'd eliminate the non-weapon proficiency groups which limited the selection of proficiencies by the character's class. 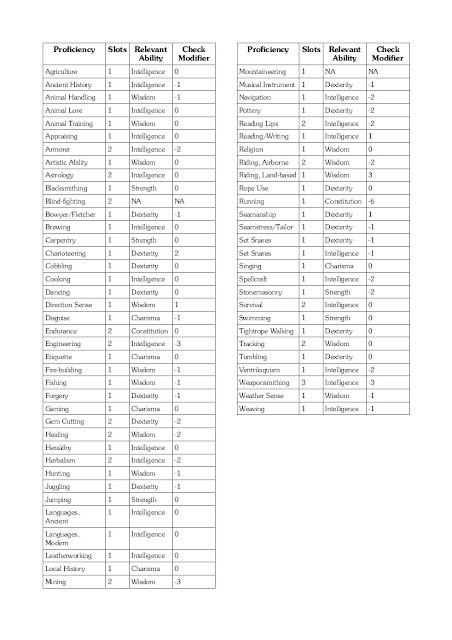 To that end, I wanted to create a master list of all the proficiencies in the PHB. Here's a rough PDF of it. Once untethered, the rocky hemisphere floats at a height of 150' above the surface of the earth. Casting this spell underground has no effect and, even when aboveground, the presence of any form of building in the affected area prevents the enchantment from taking hold. Buildings may, however, be constructed freely upon the surface of the hemisphere once it is afloat. An elementalist of 7th level or greater who stands atop a skyland may command it to move through the air. This requires the summoning of an air elemental of 8 or more Hit Dice, which is magically bound into the floating hemisphere for a period of 24 hours. During this time, by concentrating, the summoner may cause the skyland to move in any direction (including vertically) at a rate of 110' per turn (3 miles per day). It requires one full turn of concentration to cause the skyland to stop or to change course. After 24 hours have passed, the bound air elemental escapes and the skyland stops moving. While moving through the air, the floating hemisphere emits an ominous droning sound which may be heard from half a mile distant. Greg Gorgonmilk and I have been dreaming for some time of a mythic, monster-haunted forest known as Dolmenwood. 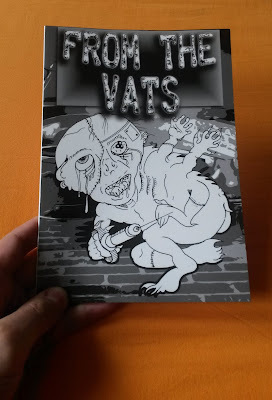 We've considered various forms of publication but have now settled on a piecemeal exposition of the locales, inhabitants, magic, and mysteries of the setting in the form of a zine. 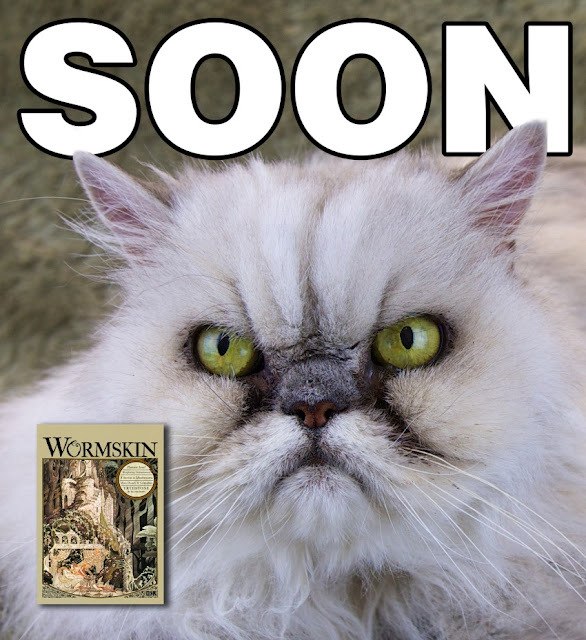 It shall be known as Wormskin. Grimalkin race-class and monster description. The mysteries of the Yrthstone, one of the many powerful standing stones in the wood. Random tables for fungal foraging. 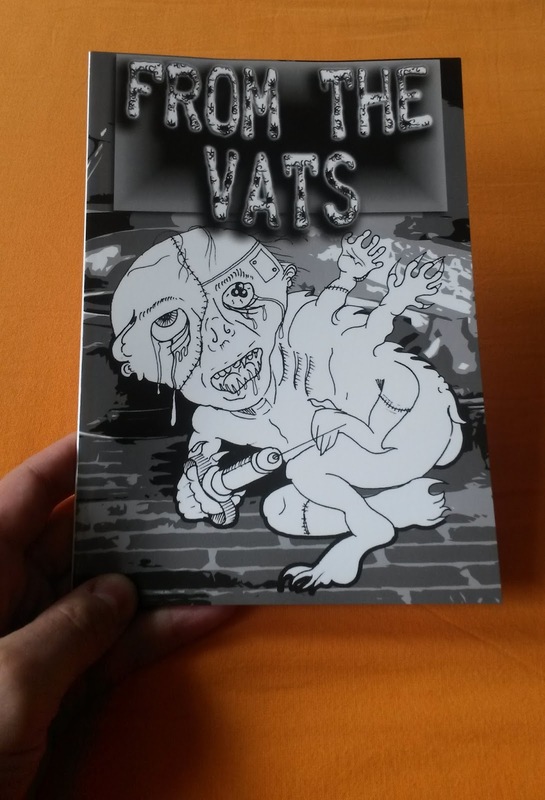 Available soon as PDF and print-on-demand, A5 softcover! I've been doing a bit more work on The Complete Elementalist, and have been putting some thought into how specialist wizards can coexist in campaigns alongside each other. Here's an extract, with some thoughts on how to handle spell acquisition and treasure placement in campaigns with multiple types of specialist wizard, each with distinct spell lists. This section contains optional guidelines for Labyrinth Lords on the subject of how elementalists (and, by extension, other wizardly characters) may gain access to and learn new spells. * Elementalists begin the game knowing read magic, one randomly selected spell, and one spell of the player's choice. * The number of spells an elementalist can know (i.e. record in his spell book) is limited to no more than double the number that he can memorize. For example, a 5th level elementalist can memorize two 1st level, two 2nd level, and one 3rd level spell. Such a character could have at most four 1st level, four 2nd level, and two 3rd level spells in his spell book. * Upon gaining an experience level, if the elementalist does not already have spells available to learn (e.g. from scrolls or captured spell books), he automatically acquires knowledge of one new spell, selected randomly from a level of the player's choosing. * Elementalists begin the game knowing read magic, two randomly selected spells, and two spells of the player's choice. * The number of spells an elementalist can know (i.e. record in his spell book) is limited by the character's INT (see the AEC). * Upon gaining an experience level, if the elementalist does not already have spells available to learn (e.g. from scrolls or captured spell books), he automatically acquires knowledge of one new spell, selected randomly from a level of the player's choosing. This spell must be learnt according to the normal rules for spell learning, again dependent on the character's INT. The basic Labyrinth Lord rules describe a single type of arcane magic, usable by magic-users and elves. The Advanced Edition Companion and other books, such as this, add further, more specialised wizardly classes: illusionists and elementalists. These new classes acquire new spells in the same means as the standard magic-user: by finding spell scrolls in treasure hoards. When it is determined that a treasure hoard contains scrolls of magic-user spells, it is thus desirable that spells usable by specialist wizards also be (at least some of the time) present. 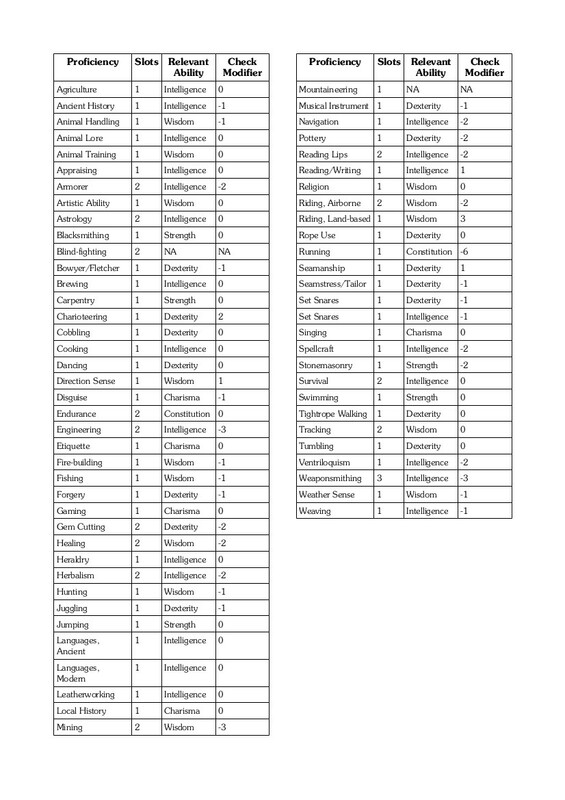 One approach is to multiply the number of spells present in the hoard (as indicated by the treasure tables) by the total number of wizardly classes in the campaign, then to give each spell an equal (random) chance of being taken from the list of each class. For example, in a campaign with magic-users, elementalists, and illusionists, the number of spells found in a hoard would be multiplied by three and each spell would have a 1 in 3 chance of being taken from the standard magic-user list, a 1 in 3 chance of coming from the illusionist list, and a 1 in 3 chance of being from the elementalist list. The Labyrinth Lord ensures, in this way, that the balance of spells available to characters of different spell-using classes remains fair and consistent. The campsite set and any evening camaraderie complete, the party settle down to sleep. Each PC must make a rest check -- a CON (bushcraft, survival) check -- modified by the various factors listed below, to discover whether a good night's rest was achieved. -1 penalty to all attacks, saves, and ability checks. This is not cumulative over multiple nights without rest, but lasts until a decent night's sleep can be had. A party may choose to travel at night and sleep during the day. This incurs a -3 penalty to rest, unless the characters are accustomed to this routine (have been following it for at least a fortnight). Continuing from my previous posts on the topic of camping in the woods, here are some guidelines for what happens once the party have located a site in which to set camp. Characters may engage in various different activities to help with setting up a campsite. The following are typical. Gathering wood: It is always possible to find wood with little suitability to building a fire (damp, rotting, frozen, etc). Finding decent wood is more difficult and depends especially on the weather. A WIS (bushcraft, survival) check is required, modified by the prevalent moisture conditions. Driving rain, for example, may incur a -4 penalty, while a spell of hot weather may grant a +4 bonus. Each character who goes gathering wood can collect enough to keep the campfire burning for 1d5 hours. Fetching water: Is assumed to be successful, in a damp forest environment. The referee may optionally declare a 1 in 10 chance of the party discovering a source of strange waters (roll on that table). Foraging, hunting, or fishing at dusk: These activities may be undertaken as normal during the hours while the camp is being set. The chance of finding anything is reduced by two thirds (due to the limited time available and the gathering darkness). A -1 rest penalty also applies. Fire building: Given a means of producing flame (e.g. a tinderbox) and a stash of wood (either gathered from the forest by other characters, as described above, or carried in packs), the party may attempt to build a fire. An INT (fire-building, bushcraft, survival) check is required. If only ill-suited wood is available, the roll is penalised by -4. The referee may apply additional modifiers based on the prevalent environmental conditions (an additional -4 penalty is suggested, for example, in snow or heavy rain). If the check is successful, a campfire is started and may be kept burning for as long as there is wood available to feed it. Resting: A character who lends no help to setting camp gains a +1 rest bonus. Once the campsite is established, more restful activities may be undertaken before the party beds down for the night. Cooking: Given a fire, cooking utensils, and ingredients, someone may attempt to cook a meal. A successful WIS (cooking) check indicates that a palatable dish is produced, granting a rest bonus to those who eat it. A failed cooking check indicates that the meal is edible but distasteful. Very low rolls may, if the referee wishes, denote a ruined meal (burned, spilled, etc) that is utterly inedible. Modifiers may apply to the check based on the quality and variety of the ingredients available. Camaraderie: Time spent around the fireside with one's companions may, given the correct conditions, lift the spirits and induce restful sleep. A character may attempt to entertain his comrades with music, song, storytelling, jokes, and so forth. This entails a CHA (entertainer) check. Success indicates that good cheer has been inspired in the party, whereas failure may fall flat or even, in the case of very poor rolls, lead to ridicule, argument, and discord. Planning: The party may use the evening hours to discuss plans for the future. Generally this requires no checks and has no effect on resting, though if arguments occur, the referee may stipulate a rest penalty due to discord. Some procedures for camping in the wilderness. The first step in camping for the night is to find a suitable location. Depending on the terrain being traversed, this may not be trivial. Searching for a site takes one hour. This is assumed to be a part of the evening phase, when the party is beginning to settle down to rest. First, the referee should make a density roll (a percentile roll against the density rating of the hex being travelled through). Failure indicates that the terrain does not yield any location suitable for characters to lay. A site with space to crouch or lean, where it may be marginally possible to sleep, can always be found. This entails a -4 comfort modifier (see rest, below). Secondly, the party must make a WIS (bushcraft, survival) check to determine the number of different locations which present themselves. The character with the highest chance of success should make the roll on behalf of the group. Success indicates that two locations have been discovered; the party may choose between them. Failure indicates that only a single suitable location can be found; the party must either camp in this place or start searching anew. If the party is unsuccessful or unsatisfied with their attempt to find a campsite, they may repeat the procedure, entailing another hour of searching. Each repeat attempt incurs a cumulative -1 comfort modifier, when the party eventually get to sleep, due to the extra time spent exploring. Each terrain type requires its own table for camping locations. As an example, here is a table suitable for use in forested areas. 1. Dry, sandy ditch. Party must sleep in a line. 2. Mossy glade. Soft ground grants +1 to comfort but dampness incurs a -1 penalty to fire building. 3. Clearing beside a pathway. Increased chance of encounters. 5. Flat, stony area beside a stream. 6. Clearing criss-crossed with gnarly roots. -1 comfort modifier. 8. Cosy, fern-filled depression. +1 comfort. 9. Sandy outlook atop a cliff. Encounter distance is doubled. 10. Small glade crossed by many small paths. Chance of encounters increased. 11. Mushroom-riddled glade. Roll on the fungi table to determine their qualities. 12. Verdant dell hidden between large rocks. Chance of encounters reduced. 13. Muddy banks of a pool. -1 comfort due to dampness. There is a 1 in 4 chance of the pool possessing special qualities (roll on the table of strange waters). 14. Among a cluster of fallen trees. -1 comfort due to the inconvenient trunks. 15. Cramped glade, only sufficient space for 1d4+2 humans. 16. Narrow ledge beside a deep gorge. -1 comfort due to fear of rolling off the edge while sleeping. The text above uses a broad notation for skill checks which can be adapted to several different game systems as follows. Basic: For games without any kind of skill or proficiency system (e.g. 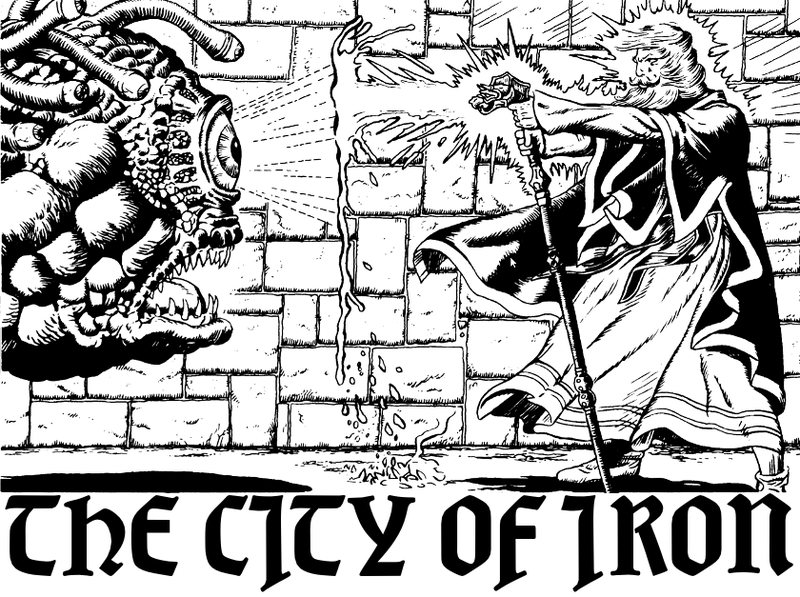 old-school Basic D&D and clones), all checks are resolved with an ability check on 1d20. A result of equal or lower than the ability score indicates success. The roll may be modified (-4 to +4) by the character's background. The referee should judge, from the player's description, whether the background experience (or lack of!) warrants a modifier to the check. Advanced: For games with a roll-under proficiency system (AD&D 1st or 2nd edition, if the optional rules are used), the player should make a proficiency check with the most applicable proficiency or use the rules for making non-proficient checks if no suitable proficiency exists. LotFP: Replace ability checks with skill rolls as appropriate. If no matching skill exists, fall back on the Basic system described above. 5e: Make an ability check as normal, adding a bonus from any applicable proficiencies. Assume a difficulty of 10. A locket, keepsake, or charm bracelet bearing a depiction or token of the subject's true love may be dweomered by this spell, granting the enchanter great control over the subject's heart. The hex may be used in two ways, as follows. Lock: The locket becomes impossible to open by mundane means. If it is open, it snaps instantly shut. From this moment, the subject's love for the one depicted in the locket becomes possessive, jealous, and paranoid, seeking to lock his love away from the world. Unlock: The locket becomes impossible to close by mundane means. If it is closed, it snaps open. The subject's love for the one depicted in the locket dissipates like a soul fleeing a corpse. In either case, smashing the enchanted locket causes the subject to fall into a deep sleep lasting for seven days. Cast while at sup, this spell acquires the confidence and loyalty of a single knife, fork, and spoon which the enchanter passes his hand over. For the duration of the meal (which can, naturally, be extended by cunning means), the enchanted cutlery observe their surroundings -- the spoon sees, the fork listens, and the knife detects the presence of dweomers. When the meal is concluded, the spying silverware will relay their observations to the enchanter, whispering with tiny, ringing voices in his ear. Alternatively, the spell may be used to conjure one complete set of cutlery, including utensils appropriate to a meal at hand, per level of the enchanter. The environmental cycles in the deserts of Ix do not follow the typical patterns of seasonal variation which are found in the various climes of Earth. The beginning of the Ixian year. For three lunar cycles, the airs of the world are turbulent and violent. For three long lunar cycles, the sun intensifies, as if in an attempt to raze the surface of the world. Water recedes deep underground, leaving the earth parched and barren as bone. In this season, much life perishes. Water consumption requirements increase by 25%. Before the year's end, the hazy violet moon has cosmological dominance for two cycles, ushering a time of wantonness, willfulness, madness, and the concrescence of dreams. Water consumption requirements reduced by 25%. Suspended in a vat of electrically charged nutrient fluid, the genetic material of a tissue sample is distilled and grows, forming a miniaturised clone of the being from which the tissue originated. The clone is mindless, non-sentient, and does not survive beyond the three days over which it develops, but represents an exact physical likeness of its progenitor. In this way, the vivimancer may be able to identify careless intruders or unknown life forms. Unlike most spells which require a tissue sample, this procedure functions perfectly well on inert biological matter such as bone, hair, shell, teeth, etc. Following on from the previous post, here are detailed the regions of desert in which the Sandestine dwell. West of Zjom, east of the night, and north of the transparent wastes lies a region of barren, dusty plains, cliffs, and jagged rock formations. The land itself seems to have been rended and broken asunder. Akin to the floating oasis, Zjom, cyclopean chunks of earth hang ominously in the bruised sky. The Sandestine of this land are few. They are of the Jilka (moon-shadow) clan and dwell primarily underground, out of the feared gaze of the looming rock-chunks. The Jilka are protected by Seraphs of the utter darkness, who have taught them a secret art of communion with the void. The sands of this region are so hot that they scorch unprotected flesh. Not only does the sun bear down here with a merciless intensity, but the earth itself seems to be heated from within. Great, black worms writhe beneath the surface. The Sandestine who dwell here, the Rigpa (talon poised to strike) clan, are not numerous, but are renowned as experts of steel-working and navigation. A region wracked by incessant winds and roiling dust storms, the name comes from the presence of the many protrusions of sandstone which jut in curious forms out of the orange sands. This northern region, beyond the main influence of the Empire, is now one of the most heavily populated Sandestine domains. It is ruled by the Kadga (knife-blade) clan, who are great merchants and are famed for their wines and cloth. A swathe of gentle, rolling dunes, dotted with many small oases, wells, and ruins. Continuous human habitation in this area for millennia has rendered the wilderness to the south (towards the great oasis cities of Aakla and Lillurm) tame. The northern and eastern reaches, where Templars and Slavers venture less often, remain treacherous. Regarded as the ancestral homeland of all Sandestine, this region is now hotly contested with the Empire of the Radiant One, who also claim it as their central dominion. This, along with the profusion of slavers (who are not in any way averse to kidnapping Sandestine), has led to many bloody conflicts and the gradual exodus of Sandestine from the area. A tenacious clan, the Sagrka (diamond) people, remain here. They are a people of war and poetry, and bitterly hate the Empire. They exclusively worship the eagle-headed Arch-Seraph Mamman, who has dominion over light, burning, birth, and re-birth. A region plagued with political turmoil, located between the religious core of the Empire (the Cathedral of Tears) and its military bulwark (Bardash and the Fortress of Resplendence). Many ancient ruins lie here, the remnants of civilisations crushed by war. Indeed, legends tell that the last battle of the great war, when the world was broken, was fought on the sands of this region. Harried by Templars, the reclusive Ulgpa (sole of the foot) clan call this desert home. They are masterful herdsmen and are said to move without a sound. It is rumoured that the matriarchs of the Ulgpa clan know of hidden ways into the ruined city of Bosj, and have witnessed perilous secrets about which they refuse to speak. 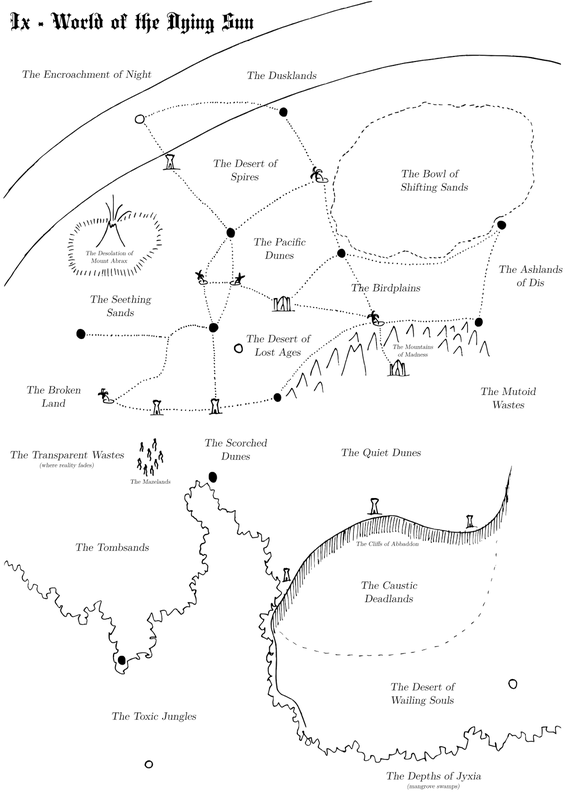 Between the unrelenting vortex of the Bowl of Shifting Sands, to the north, and the threatening barrens of the Mountains of Madness, to the south, lies this land of wide-open vistas, rocky crevasses, hidden springs, and stunted savannah. Giant mountain eagles range in the skies above, hence the name. The Sandestine who dwell here are of the Kalam'h (withered leaf) clan, and are renowned for their hospitality, their feasting, and their exquisite tents. Only marginally habitable, this barren expanse of dustland rolls eastward to an indeterminate end. The land here is tainted with an energy of unknown origin which causes the mutation of biological life. The native flora and fauna is twisted and hostile. The eastern reaches of this land are so infused with mutagens that humans perish there within days. A scant few Sandestine call the western regions of this land (south of Hul Nostra) home. They are of the Zkamga (lizard fang) clan and are known as breeders of lizards of all kinds and manufacturers of the most advanced osmosis suits. A region of black sand, scarred by ancient war. Deep wells exist here, around which unusual plants and animals dwell -- all have taken on an ashen hue and shun daylight. A near-extinct Sandestine clan lives here, known as the Hlahla (gullet). The ongoing war between the Empire of the Radiant One and the deamon-city of Agra rolls back and forth across this land, devastating it and its native people. The Hlahla are unusual among Sandestine in that they have a patriarchal society, ruled over by a shamanic order called the Dahron. They are masters of herbs and fungi. The desert people of Ix, known collectively as "Sandestine", divide the known plains and dunes into eighteen regions. Here follows their lore on those which are inhospitable to human life. It is believed that, in ancient times, the northern sands were cool, hospitable regions, guarded by Seraphs (benevolent spirits of shade) and blessed with a profusion of oases. Since the beginning of the dark age, no life may flourish here in the eternal dusk. Scarred by the frequent eruptions and emissions of the great volcano, whose name derives from the ancient dragon who dwells in its core, this region is hazardous to traverse and is shunned by all desert folk. Inhospitable due to its twisting winds and treacherous dunes, the Sandestine regard this lowland region as accursed, home to Ahamol, spirits who devour souls, and ruled by the snake-deamon Boal, who resides upon a crystalline plateau lost among the dunes. East of the cities of Kalamd and Hul Nostra, all life ends. The desert sands are replaced with brittle ash and the air is filled with smoke. The extent of this toxic region is unknown, as no one has traversed its depths. No Sandestine venture here as it is said that these placid, barren dunes work a sinister influence on men's minds, driving them to insanity, suicide, and cannibalism. No living Sandestine is said to have traversed the Cliffs of Abbaddon to descend to this region, but legends tell that it is utterly toxic to human life. The very sand is said to dissolve flesh, and the air to burn skin. Also legendary and unknown to those who traverse the desert sands in the current day, Sandestine believe that the souls of those who die without honour are banished to eternal torment in this land. This region of maze-like sandstone spires and ridges is inhabited, but not by humans. Strange beings of wood and smoke, known only as "maze-dwellers", live here. They are said to be the guardians of a gargantuan water-deamon who slumbers in a vast cyst of dark water at the centre of the maze. While the maze-dwellers are not said to be hostile to humans, the rapacious giant insects which also make their homes here are. The fell magic of the deamon kingdoms oozes across this land which was once home to an ancient people known as the Haddrim, who built great cities of imperishable, grey stone. The blasted remnants of their cities and mausoleums litter these sands. The dead have been awakened and scour the dunes for mortal life, which they drag into accursed tombs and crypts to perish in the dark. The sands of the desert suddenly give way here to a seemingly endless plane of glass. Beneath the surface, terrifying forms are said to leer and swirl. Legends say that, after several hundred miles, the glass plane fades into a vortex of mist and sucking winds, pulling all matter into the hell-void at the end of the world. Part 2 describes the lands inhabited by the Sandestine.